President-elect Trump is about to be sworn in as the 45th President of the United States. Between now and then (and continuing into the first few months of his presidency), he and federal agencies will select new leadership and establish their policy priorities. Though the Trump administration has spoken little about its acquisition policy, the transition and campaign websites provide some insight about the acquisition agenda that the new administration will pursue, as well as other policies that may impact government contractors and federal acquisition personnel. Long, lon ago, in an election year far, far away, President Obama had a pretty good idea for streamlining government. In 2012 he proposed consolidating six agencies that focus primarily on business and trade — including the Small Business Administration (SBA) — into one new department. Mr. Obama argued this would enable small businesses to navigate the dizzying array of programs supposedly designed to help them. Alas, the idea went nowhere, amid opposition from the small business lobby and the small business committees in the House and Senate with which that interest group enjoys a symbiotic relationship. We recall this forgotten episode only to note that President-elect Donald Trump’s pick to head the SBA, former World Wrestling Entertainment chief executive Linda McMahon, supported Mr. Obama’s notion during her (unsuccessful) campaign for the Senate that year — and to point out that, given what little else is known about her policy views, this history is a modest point in her favor. The third-largest federal agency needs to streamline its acquisition process and address continuing reports of waste, a bipartisan group of House members said Monday. In introducing a bill (H.R. 2199) to step up oversight and strengthen the ability of top procurement officials to re-work contracts, leaders of the House Homeland Security Committee expressed impatience with Homeland Security Secretary Jeh Johnson’s ongoing “Unity of Effort” initiative. They also called for “clarity” for U.S. businesses that contract with DHS. 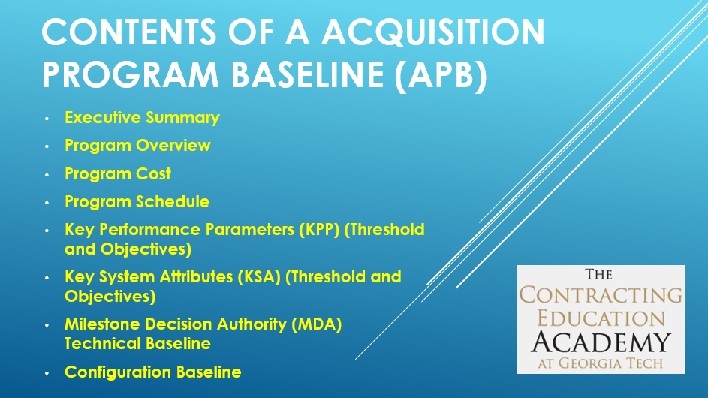 An Acquisition Program Baseline (APB) allows a Program Manager (PM) to track program goals against a formal baseline. This tracking will alert the PM to any potential problems that might arise and to perform corrective actions to keep a program within its goals. Proposed legislation would require every major acquisition program within the Dept. of Homeland Security to have an approved APB document. Forrest Gump was right. “Stupid is as stupid does.” It is coming as no surprise that “sequestration,” the dumbest fiscal management policy ever conceived, is already producing some pretty mindless results. As bad as the damage is from enduring automatic salami-slicing of budget line items, perhaps what is worse is the evisceration of already low public confidence in both legislative and executive branch leadership, coupled with the complete demoralization of the career public service facing furloughs on a regular basis for the next several months. Sequestration was created by frustrated budget negotiators who felt that the pain it might portend would be so great that surely wiser heads would prevail and a budget deal would be achieved. Clearly, the negotiators underestimated our government’s capacity for sustaining self-inflicted wounds. It is as if the now-recognized “Mayhem” guy of Allstate commercial fame has found a new job. Congress and the Defense Department need to simplify the department’s confusing and burdensome acquisition regulations in order to make the jobs of the acquisition workforce and contractors easier, the House Armed Services Committee recommended in a new report. In one recommendation, the report says DOD and Congress should embark on a comprehensive review of laws and regulations related to procurement. They then should attempt to amend or even repeal outdated regulations. In doing so, officials should consider whether a rule has had unintended consequences that outweigh its original purpose. “This effort should be undertaken with an eye to simplifying and streamlining all aspects of the acquisition process and reducing the negative cost and schedule impacts,” according to the report released March 20. The House committee’s Panel on Business Challenges Within the Defense Industry released the report after discussing acquisition issues with more than 150 people from government, industry, think tanks and academia. The panel learned in those discussions that the acquisition rules are constantly changing and are extremely complicated. The result is unnecessary complexity, confusion, and poor execution, which only furthers challenges for the acquisition workforce, according to the report. The Office of Management and Budget urged agencies on March 20 to take similar steps in an effort to avoid duplication among regulations. It even urged agency officials to talk to contractors and other experts before they issue a proposed rule. DOD’s acquisition rules are off-putting to some companies, the panel wrote in its report. 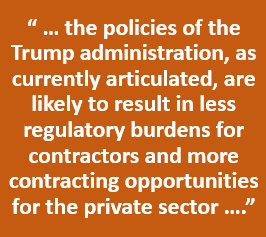 “The plethora of regulations specific to government and defense contracting dissuades many companies from competing for government contracts,” the panel found. The complexities also make it tough for the department’s acquisition workforce, which is going through a slow rebuilding process. Employees need a lot of training to understand the ins and outs of the acquisitions regulations and manage complex procurements, the panel wrote. The workforce took a hit in the 1990s with a major reduction in its numbers. Nowadays, defense officials are attempting to rebuild it. They have hired a lot of new employees, dubbed by the panel as a “new-hire bulge.” Meanwhile many senior members are eligible for retirement. “These parallel bulges constitute a ‘bathtub effect’ as mid-career personnel are not abundant enough to adequately replace the retirement bulge, nor provide for enough on-hands mentorship to the new-hire bulge,” the panel wrote. DOD’s training now is very important, the panel added. Maturity in the job and higher education are keys to a strong workforce. It’s more than numbers. Higher education equips acquisition workers with complex skill sets in finance, systems engineering, logistics, and operations management needed to administer large contracts and manage long-term technology projects. In President Barack Obama’s fiscal 2013 budget proposal, DOD requested $374 million in its acquisition workforce development fund for recruiting and hiring acquisition and only $120 million, or less than a third, for training and development of the workforce, the panel points out. “Just as it takes many years to develop a military leader capable of commanding at the senior ranks of the operational force, it takes a similar amount of time to develop an acquisition professional with the knowledge, skills, and experience needed to manage large defense acquisition efforts,” the panel wrote. About the Author: Matthew Weigelt is a senior writer covering acquisition and procurement for Federal Computer Week. This article appeared Mar. 22, 2012 at http://washingtontechnology.com/articles/2012/03/22/regulatory-reform-dod-acquisition.aspx?s=wtdaily_230312.